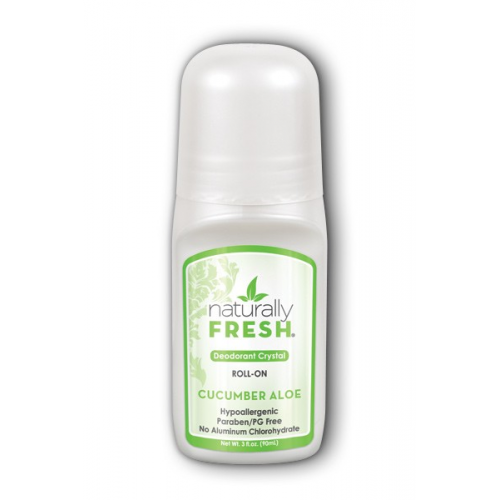 Roll-On Deodorant Crystal formulated with natural ingredients to eliminate odour-causing bacteria, while providing 24 hour non-staining, hypoallergenic protection. Chamomile is added to soothe and moisturise shaved underarms. Non-sticky and non-greasy - feels like a luxurious skin lotion. Provides natural and gentle protection without harmful chemicals. Naturally Fresh Deodorants are 100% pure and natural, non-staining, and provide up to 24 hour, hypoallergenic protection against body odour.